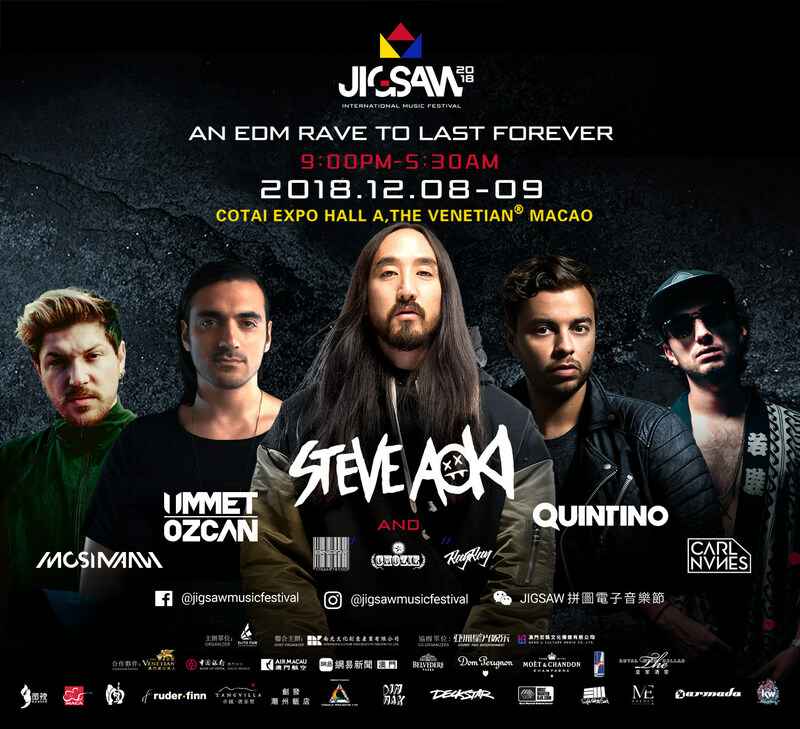 JIGSAW International Music Festival returns to Macau on 8 December 2018 to bring audiences a night of world-class DJ performances, headlined by the legendary Steve Aoki, and the latest in electronic dance music from around the globe. Last year, the inaugural festival drew a crowd of 10,000 people, with 100,000+ tuning in to the festival online via live broadcast. This year’s event, organised by Elite Fun Entertainment Limited, will take place at The Venetian Macao Golden Light Exhibition Hall A from 9 PM to 5 AM, and will feature some of best in the international DJ scene. Headlining the festival will be Steve Aoki, who will perform alongside high-profile names such as Quintino, Ummet Ozcan, Carl Nunes, Quentin Mosimann, as well as Binary, DJ Chozie and DJ Rayray. For JIGSAW International Music Festival 2018, organisers are working with a renowned stage production team to use creative stage design and lighting effects to put together the ultimate immersive and visually-inspiring EDM experience under the theme of “Future. Tech. Music”. The event space, which can hold up to 10,000 people, has a unique central dance floor that extends across the hall, allowing audiences to get as close to the stage as possible. The dance floor is lined with VIP booths, offering a diverse selection of fine wines and snacks to truly create a music festival experience like no other. Headlining JIGSAW International Music Festival 2018 is none other than the Grammy-nominated producer and DJ, Steve Aoki. The Miami-born musician currently is #9 on the Top 100 DJs ranking by DJMAG and has collaborated with a long list of famous artists that include Daddy Yankee, Linkin Park, Fall Out Boy and more recently, Louis Tomlinson on the hit single, “Just Hold On“. Aoki tours over 200 international shows and music festivals annually, including Tomorrowland and Ultra Music Festival, and will surely bring the heat to the JIGSAW stage. Also performing at JIGSAW 2018 is Dutch DJ and producer Quintino, who burst into the global dance music scene in 2011, when he released his album with Sandro Silva, Epic, which went platinum, setting the foundation for his successful career as an international DJ. He quickly jumped from #80 on DJMAG’s list of TOP 100 DJs in 2016 to #32 in 2018, with major tracks “Freak” and “I Just Can’t” crossing over 40 million views online. Another high-profile name to appear in the JIGSAW 2018 line-up is Ummet Ozcan, whose hits include “Raise Your Hands”, “Smash” and “Superwave”. He has performed at major EDM festivals around the world such as Electric Daisy Carnival, Creamfields and Global Gathering. Carl Nunes, one the most influential DJs from Latin America, and Quentin Mosimann, #93 in the world according to DJMAG’s Top 100 DJs, will also be taking over the JIGSAW stage this year. These performances will be supported by the also much-anticipated warm-up DJs, including Binary, DJ Chozie and DJ Rayray. With such a hard-hitting line-up, JIGSAW International Music Festival 2018 is setting out to be an unmissable night for EDM fans in Asia and around the world. In celebration of the 2018 Macau International Start-up Week, a limited number of discounted Early Bird tickets for JIGSAW International Music Festival 2018 were on sale from 20-22 September 2018. Official ticket sales will begin in mid-October. Further details will be announced soon. 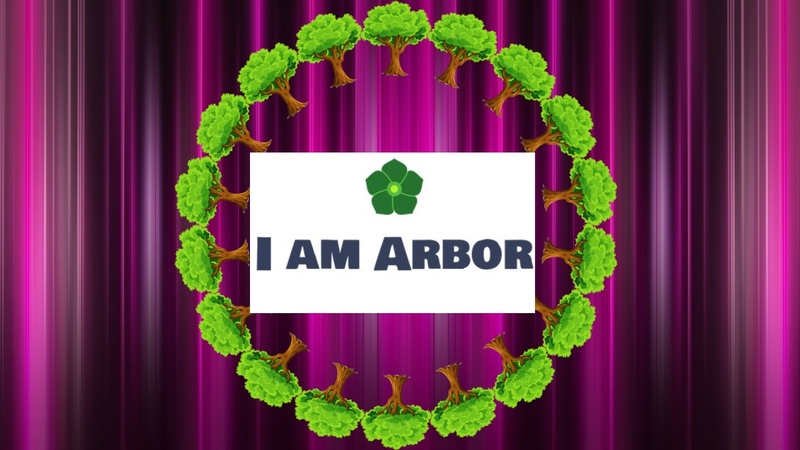 The premiere of the latest film ‘I am Arbor’ written and directed by the award-winning film maker and Co-founder of AAJ Media Productions Jijo Sengupta, will be screened in select theaters in May this year. A father and child actor duo will debut in this heart touching story on a theme that brings a new idea that plants have emotions. After the successful production of ‘Ping Pong’d’, an animated short film and the music video ‘RED’ that was internationally acclaimed at several Film festivals globally; director Jijo Sengupta, once again brings a social message to this world, through his animation short that is a fusion of Live Action and 3D Animation . Set in the backdrop of an emotional journey of a child, growing up with a tree that comes alive as characters; this film encapsulates the raw emotions and feelings of plants that have enabled the survival of human species on this planet. “This movie sensitizes everyone living on this earth, to once again ponder on the deep bond that exists between trees and human beings. I have attempted to bring on screen, the organic feelings and emotions between objects and subjects,” said Jijo Sengupta, Writer and Director of the Film. The school of Film and Animation at Rochester Institute of Technology, NY and AAJ Media Productions in Mumbai, collaborated in making this production come alive for Nature Lovers in the world. Will Bagley, a journalist known for monumental nonfiction books about the Mormon West and overland trails, will receive the 2019 Owen Wister Award for Lifetime Contributions to Western Literature from Western Writers of America (WesternWriters.org). Bagley will also be inducted into the Western Writers Hall of Fame, housed outside the McCracken Research Library at the Buffalo Bill Center of the West in Cody, Wyo. The nonprofit guild’s highest honor will be presented during Western Writers of America’s convention June 19-22 in Tucson, Ariz.
Bagley is a three-time winner of WWA’s Spur Award for “Blood of the Prophets: Brigham Youngand the Massacre at Mountain Meadows”; “The Mormon Rebellion: America’s First Civil War, 1857-1858”; and “With Golden Visions Bright Before Them Trails to the Mining West, 1849–1852,” all published by the University of Oklahoma Press. Bagley has also received the Western Heritage Wrangler Award from the National Cowboy and Western Heritage Museum and the Caroline Bancroft History Prize. His books have also been honored by Westerners International, Utah Division of State History, Wyoming State Historical Society and the John Whitmer Historical Association. Bagley’s other books include “South Pass: Gateway to a Continent” and “So Rugged and Mountainous: Blazing the Trails to Oregon and California, 1812–1848,” both Spur Award finalists. Since the early 1950s, Western Writers of America has honored and promoted all forms of literature about the American West. Previous Owen Wister honorees include Pulitzer Prize winner N. Scott Momaday; historians David Dary and Robert M. Utley; and best-selling novelists Rudolfo Anaya, Elmore Leonard, Tony Hillerman and Lucia St. Clair Robson. The Wister Award is a bronze statue of a buffalo created especially for Western Writers of America by artist Robert Duffie. Park Hotel Tokyo announced on February 19 that the elevator hall which was created as an extra production of the “Artist in Hotel” project is complete. 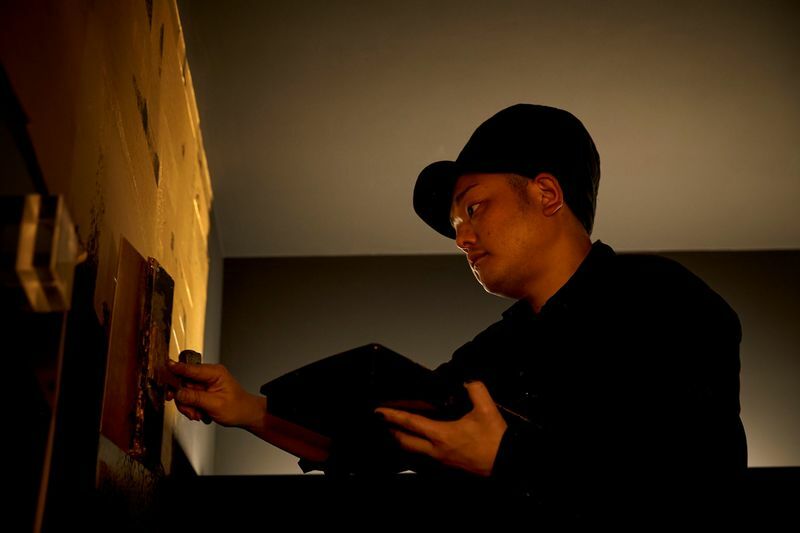 The “Artist in Hotel” project is Park Hotel Tokyo’s version of “Artist in Residence” programs, whereby Japanese artists stay at the hotel and paint on walls and ceilings in guest rooms based on the concept “beauty of Japan.” In 2017, the project was honored at the Japan Tourism Awards. Artist OZ-Yamaguchi Keisuke, who worked on “Artist Room Kabuki” for the “Artist in Hotel” project, painted the second-basement floor elevator hall under the theme of “HAZAMA (interstitial space).” This means that the “spatial beauty” unique to Japan can now be enjoyed in the key space that welcomes guests to the hotel. Park Hotel Tokyo hopes that more guests will enjoy the “beauty of Japan” through this new art work in the form of an elevator hall. Park Hotel Tokyo, opened in 2003, is located on the 25th floor and above in the Shiodome Media Tower. The 25th floor has the lobby and reception desk besides restaurants and a bar. The city’s view can be enjoyed through the windows behind the reception desk. There are 270 guest rooms, located from the 26th to 34th floors. In 2013, Park Hotel Tokyo put forth a new concept, “Infinite time and space amid cognizant Japanese beauty.” In line with this, every room on the 31st floor is decorated and turned into Artist Rooms, based on the theme “Beauty of Japan.” To offer a memorable experience in various parts of the stay, Park Hotel Tokyo will continue to maximize the role of Japanese aesthetics and hospitality.